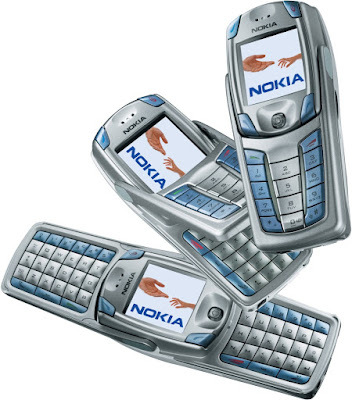 A pair of handsets from Nokia’s “weird phase” in 2003, the Nokia 6800 series of devices attempted to make messaging easier by adding a large keyboard, while at the same time keeping the size and weight down to that of a standard mobile phone. Both phones were derived from the original Nokia 6800 launched the previous year and copied the novel unfolding keyboard that it had pioneered. Cleverly hidden underneath the numeric keypad was a QWERTY keyboard which opened up by a hinge halfway up the screen. This led to the unusual layout of having half the keyboard on each side of the display. The Nokia 6810 was a straight upgrade of the previous year’s phone, but adding Bluetooth in addition to the FM radio the 6800 had. The Nokia 6820 came with a basic CIF camera and a more compact keyboard which meant that the phone was more compact than the 6810. The 6820 was sold more to consumers, the 6810 was marketed at businesses – especially for email. The 6810 and 6820 were certainly a triumph of industrial design and they certainly had the “wow factor” when opened up. However, the keyboard arrangement forced you to use two hands (unlike a contemporary BlackBerry) and the whole thing definitely looked rather strange. They were a niche success in the end, and although sales were quite low these funny little handsets did have their fans. Two years later, Nokia tried the same format again with the Nokia E70. This was a much better phone all around, but it still failed to break the mould in the way Nokia would have hoped. These handsets are quite collectable today, with prices starting at around £40 or so and going to up a couple of hundred for ones in perfect condition. They’re an interesting glimpse into what might have been, and are certainly testament to Nokia’s efforts in coming up with new ideas… even if you really wouldn’t want to be seen using one in the street.